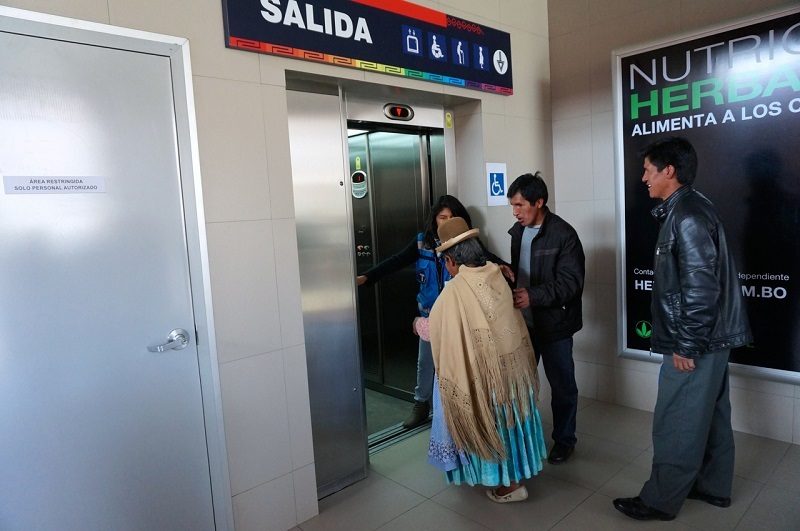 Residents of the La Paz/El Alto Metropolitan area now have a new option for navigating the region’s mountainous geography. 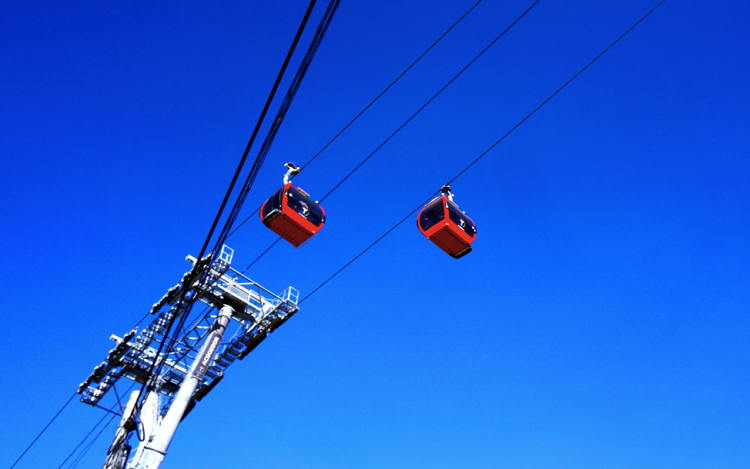 The first line of the Mi Teleférico (My Cable Car) system opened May 30, 2014, and interviews with new riders show overwhelming support for this new transport mode between the two municipalities. At 4,150 meters (13,615 ft) above sea level, El Alto, Bolivia is the highest city in the world. The fast-growing municipality perches on the edge of a steep canyon overlooking the city of La Paz, an average of 500 meters (1,640 ft) below. El Alto was once a suburb of La Paz, but has recently grown even larger than the Bolivian capital. 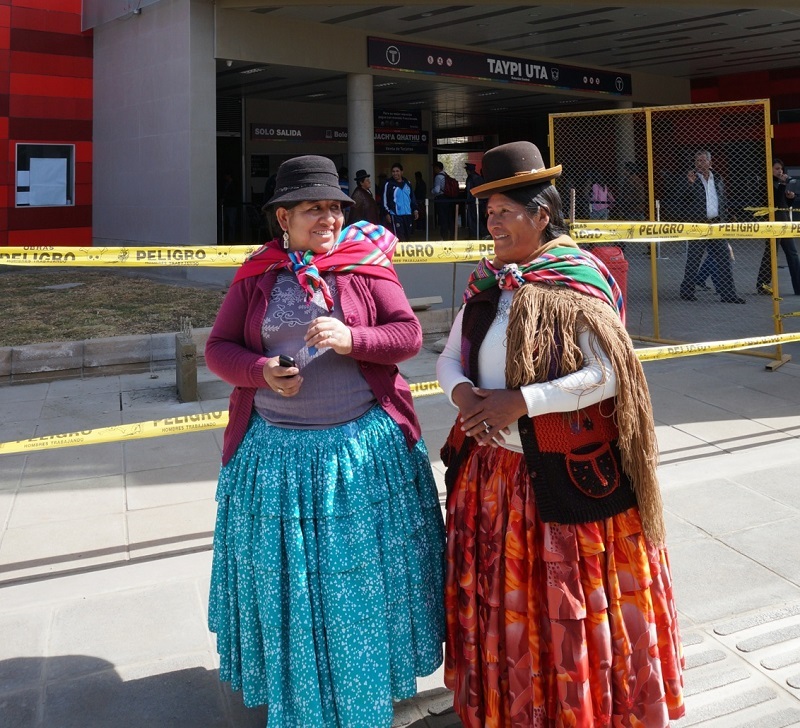 El Alto and La Paz have a combined population of nearly two million people, and public officials estimate that 85 – 90% of them rely on public transport. Though the two cities form one integrated metropolitan area, until recently, the only major route between them was the often-congested highway that winds down the canyon walls. The La Paz-El Alto Highway makes many turns as it climbs the canyon rim. Shown here on a Saturday, it is often severely congested on weekdays. Photo by Gwen Kash. Mi Teleférico is a work in progress and the inaugural red line is the first of three planned routes. At all three stations, construction is underway to create intermodal transport terminals. The green and yellow lines are more than 70% complete. The full system will include 11 stations and lines to cover 10 km (6 miles). It will be capable of transporting 6,000 passengers per hour. So far the system has been even more popular than expected. Technical studies predicted ridership would be around 35,000 users daily, but the actual average ridership has been around 42,000. However, the cable car’s popularity has meant the line’s central station has been plagued with long lines and waits of up to 90 minutes. A major cause of delays has been lengthy queues to purchase single-ride tickets. 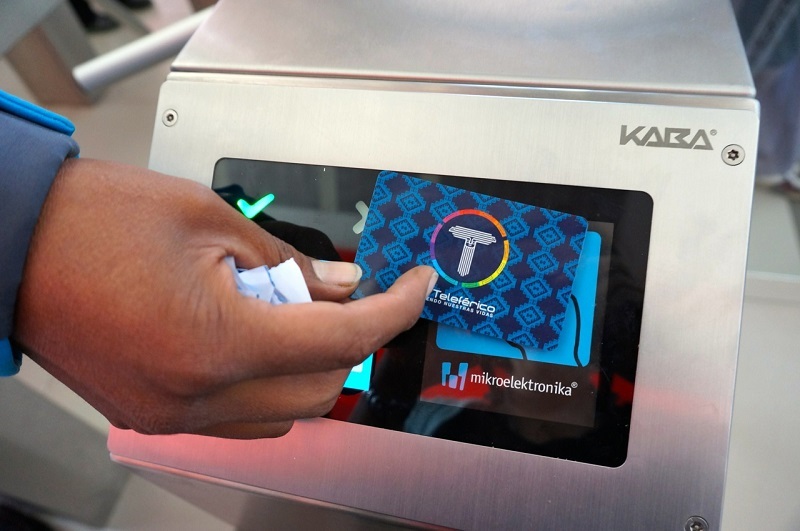 Intelligent fare-cards, which became available on June 14, 2014, should reduce the wait time. An attendant stands by the turnstile to help users learn to operate their new smartcards. Photo by Gwen Kash. Despite the delays, users’ responses to the new system are overwhelmingly positive. In interviews, riders characterized the system as fast, reliable, and beautiful, and considered it much higher quality than the region’s conventional public transport. The Mi Teleférico has the potential to significantly improve quality of life in the city. 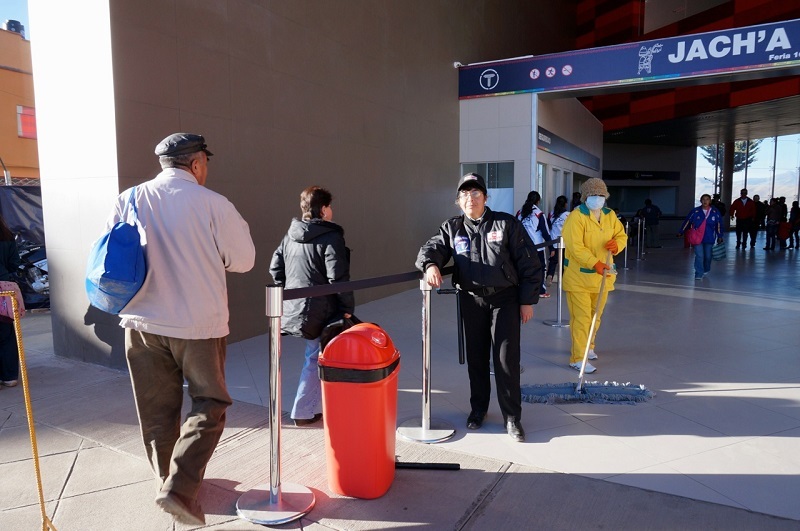 The Bolivian Information Agency estimates that red line users will save between 15 and 40 minutes per trip, but users believed their overall savings could be much greater because of the greater predictability of the teleférico when compared to buses. 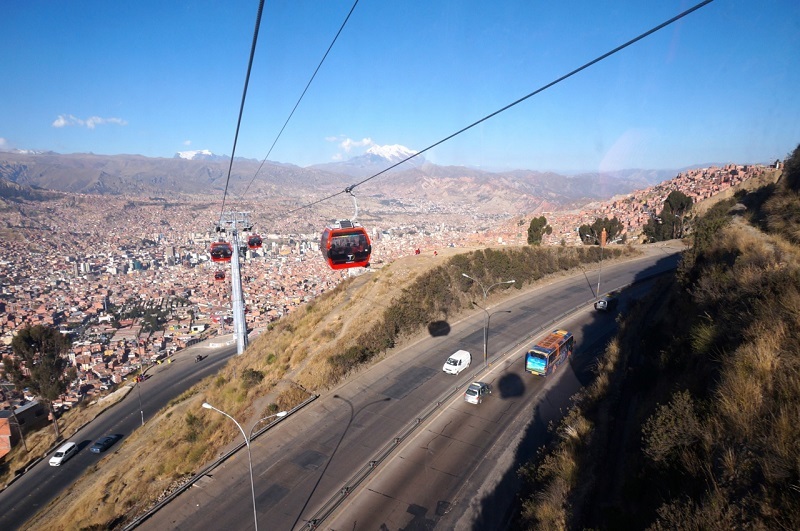 Though the teleférico fare is more expensive, bus passengers from El Alto have to transfer in order to reach La Paz, meaning the cable car will save passengers time while making their trip more comfortable. Further, many drivers illegally require passengers to leave the vehicle in the middle of a route so that they can pick up additional paying passengers (sometimes including those they just forced to leave). As a result, the teleférico can actually be cheaper than conventional buses, and certainly less of a hassle. This is particularly significant in a city where the lowest-income users are reliant on public transport. Janet Milenka Castro (center) works for a private security company. Her previous assignment was at a pharmacy, but she prefers the atmosphere at the teleférico. “It’s like Christmas! Everyone is very happy. The children especially love the teleférico.” Photo by Gwen Kash. Mi Teleférico also offers substantial benefits to disabled residents. Luís Carlos, a rider on the teleférico, explained that it is very difficult for him to use the city’s conventional minibuses. Many taxi drivers also charge disabled passengers a premium. Instead, the Mi Teleférico will be offering half-priced tickets to disabled users starting on June 30, 2014. Stations are wheelchair accessible, and signage is accessible to the blind. In addition to the federally run teleférico, other projects are expanding sustainable mobility for the city’s residents. The city of La Paz is expanding the PumaKatari bus service, and El Alto is planning a bus rapid transit (BRT) system and cycle paths to help residents reach the cable car in a sustainable way. More ambitiously, the municipalities are collaborating on a plan to revolutionize all transport in and between the two cities. On June 13, 2014, the municipalities signed an agreement authorizing a bi-municipal committee to move forward with studies for a planned Integrated Mass Transport System. The SITM (for its Spanish acronym) will fully integrate all transport service and fares, including Mi Teleférico. For now, residents admire the view from the cable car as they look to the future of sustainable mobility in the region. 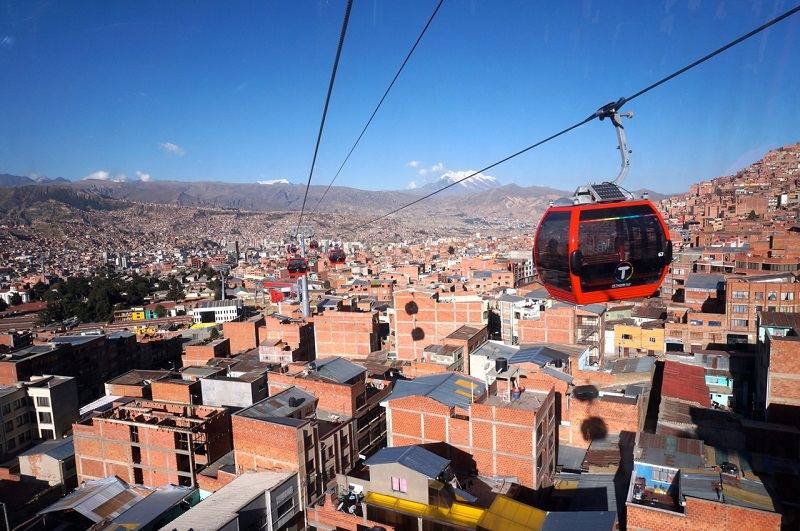 The teleférico is an important new asset for sustainable mobility in the La Paz/El Alto Metropolitan area. Photo by Gwen Kash. Research for this article was conducted by the author and included interviews with Mi Teleférico and conventional bus passengers, along with members of the planning team in El Alto, and with Rodrigo Criales, head of the Bi-Municipal Committee for the Integrated Mass Transit System in La Paz and El Alto. Raleigh McCoy assisted with interviews.